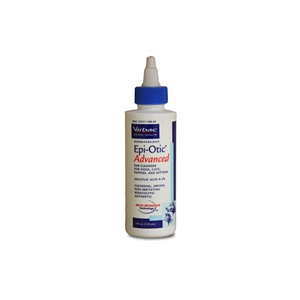 Epi-Otic Advanced Ear Cleanser, 8 oz by VIRBAC CORPORATION is a gentle ear cleaner for dogs and cats. This dog ear drops contain salicylic acid 0.2% and comes with cleansing, drying, non-irritating, keratolytic and antiseptic properties. The Advanced formula also has anti-adhesive properties that prevent microbes from attaching to the ear. Ear Cleanser’s patented anti-odor technology eliminates ear canal odor. This pet ear cleanser with anti-odor technology may be used in dogs and cats of any age. You can order the Epi-Otic Advanced Ear Cleaner for pets and other prescription drugs for pets at pet drugs online. At our Texas based pet pharmacy online, we offer quality pet prescription medication for your beloved pet. This pet ear cleaner may be used to cleanse ear canals with severe otitis externa or thirty (30) minutes prior to administration of other ear preparations in the treatment of otitis externa in dogs. If 30 minutes is not feasible, the ear canal should be gently dried with a cotton ball, followed by administration of other ear preparations. This dog ear medicine may be used in dogs and cats of any age. Salicylic Acid 0.2%, in a mild citrus aroma cleansing solution with patented anti-odor technology, containing disodium EDTA, docusate sodium, PCMX, a monosaccharide complex (l-rhamnose, d-galactose, d-mannose), and FD&C Blue #1. Shake well before use. Turn the white nozzle to open the product and then apply liberally into the ear canal of your pet. Gently rub the base of the ear and then wipe the interior of the ear flap with cotton or a cloth moistened with EPI-OTIC ADVANCED Ear Cleanser for cats and dogs. From two to three times a week to daily for routine use, before each ear treatment in the case of otitis externa in dogs, or as directed by your veterinarian. Keep this pet medication out of reach of children. This dog ear medicine with anti-odor technology is for animal use only. These pet prescription medicines are for topical use only. Avoid contact with eyes. In case of contact, flush eyes with water and seek medical attention if irritation persists. Do not use this pet ear cleanser in ears with ruptured tympanic membranes (eardrums).